Visit magnificent Whitehaven Beach with its white silica sands, explore secluded bays with crystal clear waters and enjoy swimming and snorkeling during the day. Take your adventure under the Whitsundays waters too by Subsea Adventure, glass bottom boat, snorkelling, diving or Seawalker helmet diving. Get up close and personal with the Great Barrier Reef. 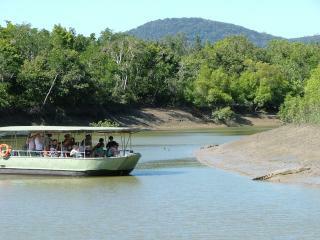 Included in this Whitsundays day tour is a calm-water river cruise along the Proserpine River sighting crocodiles and other wildlife, an open-air wagon tour through wetlands, a crocodile and native animal show and a mud crab capture and display! Proserpine River Eco Tours limits numbers to 31 per vehicle, and a comprehensive, interactive commentary delivered personally by our experienced guides, guests are assured of a quality nature experience. Enjoy a scenic flight over the Whitsundays Islands and Great Barrier Reef and take in the true magnificence of the area with its many coral reefs, atolls and island with bright white sandy beaches scattered in the sapphire blue waters of the Great Barrier Reef.